Right after the final ceremony, GM Francisco gave an interview in which he talked about his feelings after having won the tournament, some of his games, his impressions about the playing venue and the strength of the Open, his collaboration with chess24.com, why Thailand feels like home, and much more. AJK: Congratulations for your great achievement. You are the new champion. How do you feel now that the tournament is over? FVP: Very happy of course. It’s been a long tournament with lots of games. I’ve played decent chess, so I’m happy about that as well. After all, becoming the champion is something special. 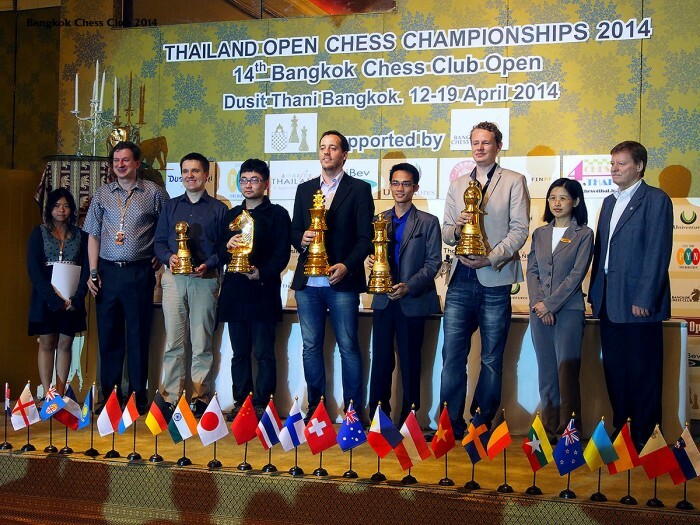 I was third when I played here for the first time three years ago [in Pattaya 2011]. I shared first place too but was a little bit unlucky with the tiebreak. This time I’m a bit luckier. AJK: What was your best game and is there a game with which you were not satisfied? FVP: Well, there were a couple of strong games. I’ve won against strong players like Suat Atalik and Qingnan Liu. These were quite interesting games. I wouldn’t say they’re the best games of my life, but in order to beat such strong players you have to play a very good game. And about my worst games – this morning at 9am. I played a normal game actually. The position was equal and my opponent [GM Oliver Barbosa] played a solid game, so I couldn’t do much. It was a draw. And especially the game against John Paul Gomez. I really felt like my brain wasn’t working. I didn’t play so badly, but I felt like something was going wrong, so at some point I decided to offer a draw, after about 30 moves. My position may have been slightly better, but my feelings were bad, so I thought it was better to stop it. With this game especially I thought it wasn’t my day. Paco Vallejo: Fiction. Isn’t that the Thailand Open? AJK: What do you think about the overall strength of the competition in the open section? FVP: This is a tournament that’s growing year by year. It is more known all over the world now. Of course, this year was a bit inconvenient because of the demonstrations. When I was on the plane I thought that maybe it was dangerous to be coming to Bangkok. I was a bit worried but was already on the plane when I realized I wasn’t going to turn around. Anyway, absolutely nothing has happened. It has been perfectly safe here. As I’ve heard and felt, Thailand is one of the safest places to be. I really feel like at home in Thailand. People are so respectful and so kind. I like it very well here. And back to the strength of the tournament. It’s growing but the political uncertainty didn’t help to encourage more people to come. Without this situation I think there could have been an extra 100 players. AJK: What do you think about our host the Dusit Thani Bangkok Hotel and the overall organization of the tournament? FVP: The Dusit Thani Hotel is simply a very good place. The rooms are wonderful and the playing venue is very good too. My only suggestions for improvement are these: to play the last round in the morning is tough for chess players. We’re not used to it. And I’m not so happy about the double-round, but understand it’s a need of the tournament. When I decided to come here I agreed on the schedule too. Playing a double-round isn’t my favorite, but it’s the way it is. And about the playing location: somehow I’ve enjoyed Bangkok much more than Pattaya. It’s much more full of life. Pattaya was a wonderful tournament too. It was beautiful and fun. But here, it’s the big city, it’s more entertaining, and it’s all interesting for me. AJK: What are your further plans for 2014? FVP: I actually have many tournaments coming up. First I play a closed tournament in Cuba against top players in the world. For example I will play against Vassily Ivanchuk and Leinier Dominguez, who are world-rated players [Copablanca Memorial Chess Tournament in Havana, 7-18 May 2014. Also invited are grandmasters GM Zoltan Almasi, GM Wesley So, and GM Lazaro Bruzon.] It’s going to be a nice tournament to be in. Then I will play the very strong rapid Leon tournament. [He’s probably referring to the Magistral Ciudad de Leon, Spain, 5-9 June 2014. In a series of short games he will face off against the GM Yifan Hou and the 14-year old GM Yi Wei both from China, and against Spanish GM Ivan Salgado Lopez.] Afterwards, I have the Olympiad coming up as well [Tromso, Norway, 1-18 August 2014] and probably some club competitions. AJK: Do you have any chess-related projects? FVP: I’m collaborating closely with this website called chess24.com. It’s been a pleasure to work on it because everyone involved has such a great vision. They have many people working on it and are developing the website constantly. I’ve made lots of videos for them, explaining openings, games, and chess in general. I have never done this before. I have to say during my first few videos I felt a bit strange in front of the camera. I’m alone there and felt a bit stupid. But after a while and a few dozens of videos I started to feel better and to be more confident in front of the camera. I think my work there is improving. AJK: This sounds like you have a long-term commitment to chess24.com. FVP: Yes I hope so. It’s a beautiful project. The preparation ran for a year and we came out with it not long ago. We’re still improving lots of things. AJK: Who else is involved? FVP: There are many collaborators. Peter Svidler has made amazing videos. Even for a player like me, being ranked 40 to 50 in the world, I enjoy his videos. You can watch them at many levels. AJK: Now that you have won the title, you have a very good reason to come back to Thailand and to defend it. What are the chances to have you back in the tournament next year? FVP: I would love to come back. I’m not exaggerating when I say it’s one of my favorite places. I’ve probably been to more than 30 countries and this place is … It feels so good to be here. It’s like home. People are so respectful and kind. Of course there are some bad things too, but being here only for ten or twenty days you don’t realize them so easily. In general I’m a bit tired of Europe. Europe is all the same and I’m a little bored there. I’d love to be in Asia or South America more often. But South America – it’s getting a crazy there. There are so many political issues, so much instability, and the crime rate is high. AJK: But most top-100 players are based in Europe. FVP: Yes, because the best tournaments are supposed to be there, but I hope in the future it will move more to the East. China and India already have very good players. FVP: … I don’t actually play that much. I don’t play so many tournaments. I play some team competitions and a few private tournaments. Probably, ten years ago, it was more important to me to be in Europe, but now it isn’t. My family and friends are there, but they’re more important than the tournaments because there aren’t so many of them. Especially in Spain, for example, we used to have lots of tournaments but nowadays we don’t. AJK: In Thailand, too, there aren’t many tournaments, there are just a handful of FMs, and the overall playing strength isn’t that high. FVP: That is because there is no tradition here for international chess. Vietnam and the Philippines have a strong tradition though. It’s something that takes time. AJK: Maybe next year you could combine this tournament with the open in Kuala Lumpur. Many players first play the open there and then come to Thailand to play this one. If you want to play 18 games in a row, that is. FVP: I’ll think about it. Playing 18 games in a row is quite tiring, but I’ll think about it. In Malaysia, right? That would be a new place for me and that’s something I value. It’s not like I play tournaments just for money. Not at all. I prefer to earn less but to have fun and to enjoy the atmosphere of new places.